Makes you feel special, doesn’t it? My Jehovah’s Witness elder friend walked into the restaurant with JW#2. It has been so long since I’ve seen him, I was wondering if JW#1 was purposefully not inviting JW#2 because he wanted to protect him from me. I am sure that is part of the reason, but the other part is JW#2 had some personal issues which kept him away also. JW#2 didn’t participate much in the discussion, but it was good to see him again. We all got caught up with each other for about half an hour and then JW#1 summarized our last discussion to JW#2 so he had an idea what we talked about last time. JW1: We talked about exercising faith. We agreed that we have to have a strong faith, that is what saves, but we have to have it reflect our works too. Your faith is so strong that is shows in good works. I couldn’t believe he said that. Last week he said nothing of the sort. We agreed that faith is important, but disagreed on the importance of works. Today, he made it sound like we were in complete agreement. I had to clarify. KW: But we disagreed on when one is justified before God. JW1: Okay, alright, but right now we’re going to see what this world will look like if God’s Word is true. I am very surprised that you believe that there is a future for Man on the earth. We jumped right into paragraph 17 of chapter three in the Teach book. We looked at some of the verses presented in the book and talked about them. There was very little with which I disagreed so we quickly covered seven paragraphs. I think that has got to be a record for us. One thing that stood out in my mind about today’s study was when JW2 took his turn to read a paragraph out of the book. It reminded me of the times I have been in a Kingdom Hall for a meeting. He sounded like a third grade teacher reading to his students in an animated voice so as to keep the attention of the children. He read much louder than was necessary for the three of us to hear at our small table. JW1: You are my reader this week aren’t you? JW2 was smiling as if he felt like he had just been complimented. From that short exchange I got the impression that JW2 was practicing for being “the reader” for the Watchtower studies. This is a responsibility that is given to those favored by the congregation elders. It sounds like JW2 is still in his honeymoon phase of being a new Jehovah’s Witness and is enjoying this little position of prominence. He certainly read the text like he was trying to impress people. When it came my turn to read, I sounded completely different. Think frog trying to cough up a golf-ball. Yeah, that bad. I wasn’t trying to impress anyone plus my throat was sore from having to sleep with my mouth open. The pollen count is still in the tens of thousands. When you take into consideration that a heavy count is roughly 500, ugh. The congestion and irritation is almost humiliating. Like I said, I wasn’t trying to impress anyone. I read paragraph 23. KW: “Dead loved ones will be restored to life with the prospect of never dying. All those sleeping in death who are in God’s memory will be brought back to life. In fact, ‘there is going to be a resurrection of both the righteous and the unrighteous.’” You’ve mentioned this before, something about God’s memory. JW1: That is the safest place to be. KW: That makes God sound like a computer. JW: That is just a term we use because that is where we store information. JW1: That is the place where we store information. Memory, memory chip, memory card. KW: Why are they using this term of God? It really does make it sound like He is a computer. If He stores us in His memory, then we are just data. KW: This is the Matrix isn’t it? You’re freaking me out here. Both of them laughed, but JW1 was quick to try and clarify. JW1: If you recall information about someone, like a dear friend, their personality, how they look, where is that information stored? KW: This is really starting to sound funny. Where is the information stored? Now I am thinking about Carbonite, the online backup service. He had never heard of the service before so I explained how it works. KW: Carbonite runs in the background of your computer and continuously backs up information stored on your hard drive. Whatever you save on your computer, it is automatically backed up somewhere else. If my computer fries, then I can get another computer and download all of the information to my new computer. That is what it sounds like we are talking about here. My Elder friend started talking about how scientists compare computers to our brains and how God can “recall” things about us. JW1: God is a person who will recall things about us. If someone remembers something about somebody, the information is stored somewhere. KW: are you saying that God recreates us from His memory? KW: That is not a resurrection. That is a clone. JW2 looked at JW1 to see how he was going to handle it. JW1: Let’s just say this. When Jesus resurrected Lazarus, decomposition had already started. Would Jesus have been able to resurrected him three weeks later? JW1: After so many years, there is nothing left. Would Jesus still be able to resurrect him? KW: I don’t think that there is nothing left. JW1: For them, it looked like a resurrection. You seem to want to be so particular about it. Cells had already died. Things needed to be replaced. In this case, Jesus resurrected him and it looked just like Lazarus when it came out. In reality it was a recreation because he wasn’t complete at that time anymore. KW: In reality, it was a recreation? KW: This is another definition that is different for us then. When I hear the term “resurrection,” the one word which comes to my mind is, “continuity.” There is always continuity between that which was dead and that which is raised. It is always physical. There is always a dead body that gets up. Even in Ezekiel 37, there is a vision of the dry bones. It is a graphic example of what a resurrection is so I don’t have a problem with God taking scattered atoms to put our bodies back together. These terms, “recreation” and “memory,” that is different. There was a long period of silence. Neither of them spoke. KW: Not only do I believe there is continuity of body, there is continuity of spirit, being or person. I believe that when I die, I am more than just a memory. JW1: Well, this is another subject. My elder friend started trying to find something on his phone. The three of us sat in silence for a bit. JW1: I can look this up when I get home. God’s memory, I mean He is a person. If someone dies, we say that we keep them in our memory, we don’t have a problem with that right? KW: Right, it just means I remember them. It doesn’t mean that there is actual data stored in my head. KW: You’re really starting to freak me out here, buddy. KW: I’m thinking of the scene in the Matrix where Morpheus pulls out the battery and tells Neo that this is what humans are like. JW1 started explaining that we can memorize things like faces and places and recognize places we’ve been because it is all stored in our memory. KW: I understand what you are saying, but my memories aren’t personal. I’m personal. JW1: You can remember people, what they were like and even their gestures. If you think about that, it is all stored up in our memory. JW1: We don’t call it data, but that is basically what it is. I started chuckling. I knew he was joking because he has told me that our conversations have led to nights with little sleep. JW2 looked shocked. I’m guessing he thought JW1 was insulting me, but when he saw how we responded to one another, he started to chuckle too. He almost let out a sigh of relief. KW: When you store those memories, that is just impersonal data which is different from the real, personal me. So when you say that God stores us in His memory, that makes it sound like it is just impersonal data. JW1: I don’t think it is impersonal. We kept going back and forth over whether or not the data stored in memories is personal or not. I tried to make a distinction between what is inside and outside of our heads. What is inside is impersonal and what is outside is personal in the actual being. Sometimes it is difficult to communicate with my elder friend because of our two language barriers. One, being that he speaks JW, and the other because English is not his primary language. I finally got him to agree with me that memories in and of themselves are not personal. KW: Okay, let’s pretend that you are God. If you are remembering me when I die, then everything inside your head is impersonal because it is just data about me. JW2: In order to recreate you we would need to place those memories in another body. KW: But those memories are impersonal. If you take the impersonal data and recreate me into another body, then that is a copy of me, but not really me since I no longer exist. JW1: What did the fellow who was executed next to Jesus say? He said to remember me when you come into your Kingdom. Memory, remember me. He wanted Jesus to remember him. Obviously, that was not the point the thief was making. He didn’t want to be left out of God’s kingdom. I was not as sharp today as I hoped to be because it didn’t occur to me until after I got home that if the thief who died next to Jesus was really asking Jesus to remember him in the sense that my Witness elder friend was trying to imply, that that would mean that this man expected Jesus to keep him in His memory not Jehovah keeping the man in His own memory. That would be problematic and I hope to make this point sometime in the future. My friend tried to explain that it makes it special and personal because it is God who is remembering us. KW: God’s memories are personal to Him, but it doesn’t mean that those memories are a real human being. What I am trying to understand is this; if someone is dead, and they no longer exist except for the data in God’s memory. They are impersonal data in God’s memory, how does copying that data into another physical body make it personal? That’s depressing because it makes it look like I am nothing but data. KW: It is a copy of me. My elder friend took out a piece of paper and a pen and asked me to list a bunch of facts about my wife. I started having a sneezing fit so my elder friend took that as an opportunity to use the restroom. While he was gone, I asked JW1 if he understood what I was trying to say. JW2: I understand and see how you say that it is impersonal, but the fact that He remembers you is what we want, what we hope for. KW: Sure, but all He is remembering is data. JW2: But if you are dead, you no longer exist. The few people you know will remember you, but as long as He remembers you, you have the hope of resurrection. KW: I don’t see that it is a resurrection because in the bible a resurrection always displays a continuity of person and body. So if I cease to exist, which is depressing, then there is no continuity there. If there is no continuity, then whatever this newly created thing is, it isn’t me. It is a copy of me. JW2: So, how do you see it? Bad timing. JW1 walked up and was pointing to the TV about some news report on dolphins. My elder friend picked up his pen and wanted me to start my list describing my wife. I hope to continue my discussion with JW2 at a later date. I listed a few things about my wife like the fact that she is a better Christian than I am, she is faithful, disciplined, likes to eat healthy, but also loves chocolate. I described what she likes and dislikes in other people. She likes transparency, dislikes fake people and is pretty good at knowing the difference between to two. She is also good with numbers. He gave a scenario about someone finding this list 500 years from now and being able to have some information about my wife. I don’t know what he was trying to do, but his illustration fell flat so he went back to talking about how Lazarus was resurrected. He mentioned that he was brought back into existence. KW: That is the problem I am having in understanding your view. If you have to bring something into existence, then there is no continuity from one being to the next. It isn’t really you, it is just a copy of you. JW: Let’s say you die an old man. You have arthritis and all kinds of other health problems. Wouldn’t you want be have a different copy of your body? KW: No. I want to be renewed. I want to be as healthy as I was when I was 19, but I don’t want a completely different body because it isn’t me. He was clearly frustrated because I didn’t give him the answer he expected. He started to flip through the chapters in the Teach book. JW1: Let’s just do this. Let’s get back to the subject. We agree that there will be a paradise on earth… let’s just read this last paragraph to end the chapter. Although I did make the same point in my own way, I think the book makes it pretty clear that Jesus said the “evildoer who died alongside him” is going to be with Jesus… in paradise. Where do Jehovah’s Witnesses think paradise is? The earth. Jesus is going to come back to the earth. This flies in the face of what the Watchtower currently teaches. I also explained how, even though I do believe that I will be on this earth again after death, I do not believe that I cease to exist when I die. I believe that the immaterial part of me goes into the presence of God in heaven and then I will be resurrected sometime in the future. I will be reunited with my physical body that will be glorified. JW1: I know that. Let’s just agree on the things we agree on. I don’t think I’ve ever heard a Jehovah’s Witness say that before. It is almost as if my witness friend is afraid to talk about things in which we disagree. Perhaps it had something to do with trying to protect JW2. He started looking at the table of contents and showed me that we would get back onto the subject of the dead in chapter six. From here on it is going to be interesting. Next week we will start talking about the identity of Jesus. The chapter after that is the Ransom sacrifice of Jesus and then we get into the condition of the dead. There is a lot of potential for some pretty heavy discussions. Keep in mind that the one topic which has driven my elder friend to threaten to discontinue our discussions is when we talk about the deity of Christ. That is next week. Please keep us both in your prayers. When discussing the identity of Jesus, sometimes it helps to start with the fact that Jesus is fully human. 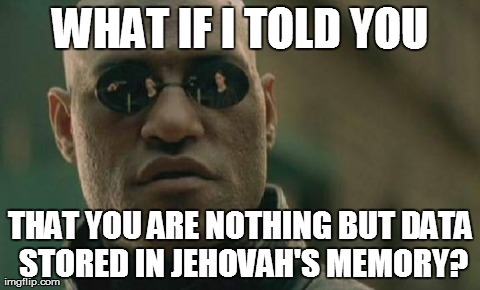 JWs don’t expect us to agree with that. It takes the wind out of their sails. Sometimes that makes it easier to move into the deity passages. I seem to remember Walter Martin suggested such an approach… JWs never look at all the key passages on a topic before drawing conclusions. The WT latches on to one or two prooftexts from which to determine their doctrines, and then ignores or twists every other passage that doesn’t square with their initial conclusion. That is a good idea. I think I will focus on that with him next week when we get into the chapter on the identity of Jesus. A question I’d ask is what the difference was between Jesus’ recreation and Lazarus’. By their own teachings, anyone who dies ceases to exist, ergo Jesus, like Lazarus at his death, was annihilated, to be recreated later. Why was Jesus’ recreation, and lets just call it what it is, anything more special than Lazarus’? To answer your question, in reality it wouldn’t be any more special. What my elder friend may not be familiar with is that the Watchtower teaches that the life force of a person is impersonal. It is the life force that Jehovah stores in his memory because the soul extinguishes once the life force is separated from the body. One way to highlight your cloning point might be to ask what would stop Jehovah from recreating 100 of you instead of just 1 from memory. Obviously, He could do that. Would all of them be you? If not, then in what sense is one of them really you? Another possible way to get your friend to understand your point would be to ask what would happen if you removed all of his memories and replaced them with yours. Would he now be you? If so, in what sense? Ask your friend what part of a person it is that goes to heaven if you are one of the 144,000. How then is that different from a soul (aside from the immortality aspect). I’m not sure if my friend knows the Watchtower answer to it or not, but he should answer that God takes the spirit of the dead and places it in a spiritual body which then results in the soul of the person who died. The problem with that though is that the only personal part of body, soul or spirit is the soul. The very thing that ceases to exist. That is why it is a recreation and not a resurrection. Before I cold get into all of that with him though, I’d have to have him explain it to me. He doesn’t know I understand what the Watchtower teaches on this subject yet, so it would be suspicious for me to start spouting off Watchtower doctrine we have yet to discuss. I think we do not get the same body back. The cells in our body have certain life spans ranging from days to months (except neurons, which do not get replaced when they die.) So, for the most part, we don’t have the same bodies as we did even ten years ago. David, they key here is continuity. If you saw a picture of me when I was in the third grade, no one would say that the body I had then was a different body. In other words, I did not climb out of that body and jump into my current one. I did not change bodies, but my body did change. I don’t quite understand — what am I missing? We physically are not made up of the same atoms as we were ten years ago. Suppose God were to go and label each atom in the universe with a unique marker. In 3rd grade you were made up of 1-2-3. Later on, you’re made up of 2-3-4 (1 was replaced by 4). Then you grow, and are now made up of 2-3-4-5. And so on…ten years later, the atoms your body is made up of is perhaps 7-8-9-10-11-12-13. None of the original atoms are still there…your body been gradually replaced. But you’re still YOU, because there is a non-physical part of you. So how can we say God uses some of the same matter to renew? What if I die, and some dude eats me and my atoms are incorporated into him? Then later, this guy becomes a Christian. When we’re both resurrected, who do these bits of matter belong to now? I don’t find any comfort in the fact that there is physical continuity…because it isn’t clear to me that this even exists after death. But that I have an immortal immaterial soul that does have continuity. This reminds me of a time when the mother board on my computer fried. When I replaced it, and went to reinstall my OS, Microsoft wouldn’t let me because “it wasn’t the same computer.” I could replace the hard drive, CD drive, sound card, video card, etc… but not the motherboard. To me, the immaterial immortal soul is the mother board. I didn’t notice your reference to Corinthians…that is interesting. It does refer to “this body,” so regardless of what I said above, God must have it figured out. Thanks. Read all of 1 Cor. 15. The WHOLE chapter is about the importance of the resurrection. Yes, there is continuity of the immaterial, immortal part of man, but there is also continuity of the body. Verse 35 asks the question of what kind of body will we have in the resurrection. Paul spends the rest of the chapter answering that question. This is one of my favorite chapters in all of scripture. Wow. So Jehovah is going to dust off my character sheet and give it another whirl? Only if you’ve been good enough to be resurrected, or have never heard of the gospel of the Watchtower. Actually I think he already has. But apparently he keeps forgetting to record my weight, and so he rolls for it each time. I’ve gone from a low of 135 to a high of 245, but now I seem to be settling somewhere in the middle. I don’t understand this comment at all. Please explain. Can you clarify that with more detail — or point me somewhere that does? I have been meeting with some JW’s, and they haven’t told me I’m lost. At what point in our TEACH book study will I be condemned to annihilation in their eyes? So they don’t even know they themselves will be resurrected?? If you die during Armageddon, can you be resurrected? If they are meeting with you on a regular basis, they are probably not going to tell you they think you are lost. Instead they will point to something like chapter 12 which is titled, “Living in a Way That Pleases God.” They will let you come to your own conclusion about what you need to do. They have ZERO assurance that they will be resurrected and are actually pleasing God. That is why they work so hard. If you die during Armageddon, you may be resurrected depending on whether or not you rejected the gospel of the Watchtower. The Edge is the official blog of Evidence Ministries , a missionary outreach to Jehovah's Witnesses and Mormons.